In 1997, as a result of growing demand for on-site systems, we established an in-house facility to manufacture, install, upgrade and maintain our network of systems for customers as well as those systems used in our own plants. Each system can be easily expanded and is designed to meet each customer’s individual requirements. Since we are in control of the work programme we can prioritise essential on-site support more easily than with a third party. The system software has been developed under licence to Antonine More importantly, we are continually adding new modules, many of which have been suggested by our customers. This is a distinct advantage over an off-the-shelf package. Using suitable VPN or Modem technology, all Antonine systems are currently linked with our technical support facilities. This allows immediate response to any technical enquiries or system failures. All press-returned inks can now be logged on to the system with the correct dilution factors, etc. The system will also prompt and, if required, insist that the user selects a suitable press-returned ink before dispensing fresh ink. By using password security the system will also highlight any users who consistently override the rework facility. The latest version of the software will allow the relevant ink formulations and quantities to be called up by job number. The database will also store quantities used and costings from previous job runs. We believe that this function is fundamental to the successful monitoring and ultimately minimisation of ink consumption. The software will allow standard costing information to be entered which can be compared with actual results data. Detailed reports can be produced on stockholdings, formulations, amount dispensed, job costs, etc. 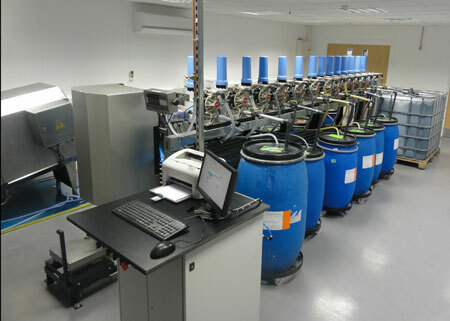 which facilitate the overall monitoring of the ink consumption. 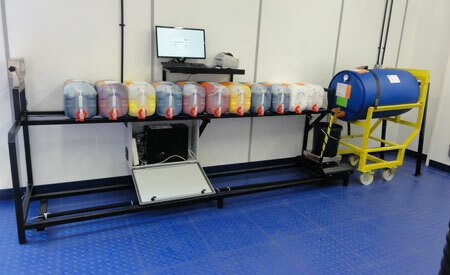 Antonine currently supply all ink dispensing systems with concentrated colour bases and technical mediums. A procedure is implemented to establish records of exact machine requirements for each ink dispensed allowing diluents to be included in the recipes to achieve a consistent dispensed viscosity. We believe that this information combined with the high standard of colour repeatability from our dispensing systems, will produce the first print at the right colour every time.